Well that was a super disappointing upload for me. No Inspire Pullover. It was good for those of you waiting for the Lolo Scuba Hoodie and the new colors of the Push Your Limit tanks but overall it was a long drawn out upload that started very early (7am). With an early start like that you would think there would be lots and lots of items uploaded. 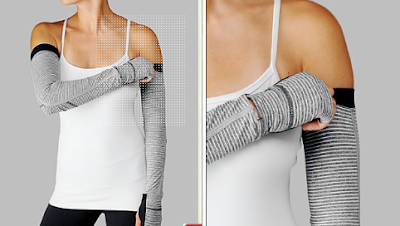 And arm warmers that you can wear with a tank top to keep warm instead of wearing a nice warm pullover.. So what did all of you get and did you find it as disappointing as I did? Armwarmers are for runners. It's not about "wearing something weird instead of wearing a nice warm hoodie". You wear them for the first bit of your run/marathon so you can yank them off quickly (and store easily) when you start to warm up. They're also awesome for dance. I'm super stoked that lulu is bringing back their armwarmers, as I think they make some of the best-definitely better fitting than say, the ones you can buy at the running room. I got all of the Brisk Run items on the US site (arms warmers, hat, ear) but would also like the neck warmer and gloves so I'll be picking those up when they are released as well. I'm a runner and haven't used arm warmers before but see the utility of it. I've always thought they were a bit funny but I'm going to give them a try since they are lulu (I'll have to figure out the right weather to use them). I wasn't sure about what size to order though…I got the M/L but I don't really have large arms. Seems like too tight and too loose would both be a problem here and I wish they had a few more options like S,M, L because then I'd feel fine about ordering the M.
I wore my senorita pink arm warmers this morning when I ran. It was 58 deg. F and they were perfect with groove shorts and a power Y tank. I like the new ones online. I might have to get those too! I am really excited about the neck warmer. I use that a lot when it is in the 20's here. It helps keep your breath warmer so you don't freeze your lungs. I didn't buy anything but I have the ear warmer in my cart. I am desperately hoping Lulu either brings back the Dance Studio Pants or something similar in Ivy or earth tones. Please! Please!! Also waiting for some long-sleeve Run tops. I got the Bon Voyage Duffel in lolo – quote excited to get it next week. Wow, I'm extremely jealous!!! 58 degrees!!! It's been 100+ here in Texas for the last two weeks….I would literally kill for weather like that….enjoy it for me! I didn't think they were just a cute/weird thing to wear. I do realize that a lot of runners use these but I just find it strange that the running accesories for fall are released and not the actual fall running clothes like pants or sweaters. I picked up a pair of the brisk run gloves the other day to store away because when it's actually time to use them lulu seems to always be out of stock of these types of things. Anon 9:03 so where do you store them when you pull them off? My fuel belt just has a tiny pocket so it gets quite crammed with other things. Would you tuck it into your fuel belt? I've put myself on a Lulu diet with the exception of fall running gear. I may cave and get the ear warmers later tonight but I'm not sure yet if I'll have a need for the toque and the neck warmer. It doesn't get that cold here in the winter but my ears and fingers do get frosty. I picked up a few more Lolo things… I'm a bit obsessed with this color. Bought the solid Lolo Scuba, Define Jacket in Lolo, Modern Crewneck Tee in Lolo, Fast in Flight bag in Ivy (yay! ), and the Brisk Run Toque. I'll likely end up returning the lolo Define, but I just have to try it on and if I don't like it, it will be going back with my ash pencil sketch Scuba next week.